Fairy Tale Noir. If it wasn't a thing before, it is now. The world is full of fairy tale retellings. There is a certain nostalgia at seeing characters popularized by the Grimms and later sugarcoated by Disney for mass consumption in stories once again very much for adults. Such stories are not rare, either. Fables took the premise and ran with it, and there are a number of television shows and movies that work with the same basic idea, though in much different ways. I can safely say, though, that The Case of the Bloody Glass Slipper manages to innovate the trope and create a living and breathing second world fantasy-noir that had me charmed from the start. Indeed, part of what makes this story stand out is that it divorces the characters from the actual fairy tales. Jimmy Prince, the hard-boiled private eye, is not the actual Prince Charming. Instead the story reinterprets the characters in a 1920's industrial setting where sickness is rampant and the divide between rich and poor is wide indeed. This story focuses on Jimmy's search for a missing woman, one he shared a single dance with. 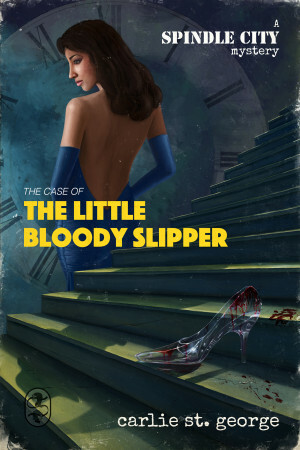 What follows is a delicious subversion of the Disney tales, where Cinderella and her sisters are assassins at large, the Fairy Godmother runs an upscale brothel, and Snow White is a damaged heir to a pharmaceutical fortune. Jimmy himself is a bit of a black sheep, one uncomfortable with the upper class he hails from because of what he's seen during a time when disease was so prevalent that people wee being burned alive to prevent it spreading. He works as a private eye with his sidekick Jack, a young street kid. The story manages to capture the feel of noir without falling for a lot of its pitfalls. Women here, while they often come off as femme fatales, whores, and victims, are nuanced and complex, and as it turns out it's Jimmy, much more than any of the women he's after, who ends up as the damsel in distress. If there's a complaint to be made about the story it's that Jimmy isn't exactly the most capable of main characters. Which completely makes sense given his background. His privilege shows as he barely-successfully navigates the dark underbelly of the city. He pushes forward, putting himself and others in danger, and only through the competence of the women around him does he manage to not end up populating a shallow and unmarked grave. Of course, this only further subverts tropes and expectations, but it does raise certain concerns over whether he should be the main character of the story at all. I'm very hopeful that future visits to the setting and characters (there are at least two more to be released over the next month) will see Jimmy grow a bit more into himself and his role and maybe able to find his sea legs, as it were. What's here, though, is very fun. There's an impressive amount of world building going on, and the action keeps things moving along in classic noir style, with kidnappings and gunfights and smoke and whisky. The stage was quite effectively set and there's a lot left to explore, politics and unrest rumbling in the background. The seeds of future stories were planted in the form of characters that, while not central to this story, made an appearance with the promise of more to come. The dynamic between Jimmy and Jack was strong and compelling, and I'm definitely interested in seeing what kinds of trouble they can get into. To make a long story short (or I suppose to make a short story shorter), this made a very nice first act of a larger story. It stands on its own, yes, but at the moment it feels like we've only just dipped our toe into this world, and assuming it's not chopped off by an errant stepsister, there's a lot of depth yet unexplored. Negatives: -1 for surrounding Jimmy with characters who feel a bit more interesting than Jimmy himself. Nerd Coefficient: 8/10 "how long do I have to wait for the next one?!" see our full rating system here. The story is available in its entirety here.